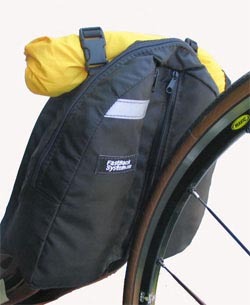 TerraCycle, of Portland, Oregon, and FastBack Designs, of Fort Collins, Colorado, two leading companies in the design and manufacture of accessories for recumbent bicycles, have announced that TerraCycle will acquire FastBack and expand its successful line of hydration packs and frame bags. "I started FastBack shortly after switching to recumbent bikes several years ago, when I couldn't find a good way to carry a hydration bladder," said FastBack founder Mike Vogl. "Since then, we've added more than a dozen kinds of hydration and frame packs which are sold around the world. "We've grown quickly, and the demands of the business require increasing time and resources," said Vogl, who is also a hospital-based registered nurse. "It is a good time for another company to take FastBack to a higher level of distribution and service." TerraCycle is a good choice to be that company, said TerraCycle president Pat Franz, because FastBack products are a natural complement to TerraCycle's racks, idlers, accessory mounts and stems. "Both companies make high quality products that meet the unique needs of recumbent riders," Franz explained, "Both companies have a strong history of listening to customer needs, and of developing products over miles and miles of real world riding." "We plan to expand the FastBack line and keep production in the U.S.," Franz said. "It's the best way to ensure quality and accountability. We've got some very exciting plans for combining the capabilities of the two companies to produce even more useful products." Effective immediately, orders for FastBack products will be filled in Oregon by TerraCycle. FastBack products can be ordered online through the TerraCycle website, www.terracycle.com, or through any FastBack dealer.